I recall sitting on a dust-covered camping mattress – about as deflated as my motivation to continue – when the first notion of what would be a life-changing and character-defining process would impregnate itself into my consciousness. I sat quietly for some time, amongst the noise of my surroundings as I processed the possibility of manifesting this idea into reality … because I felt the gravity of circumstance which necessitated change. 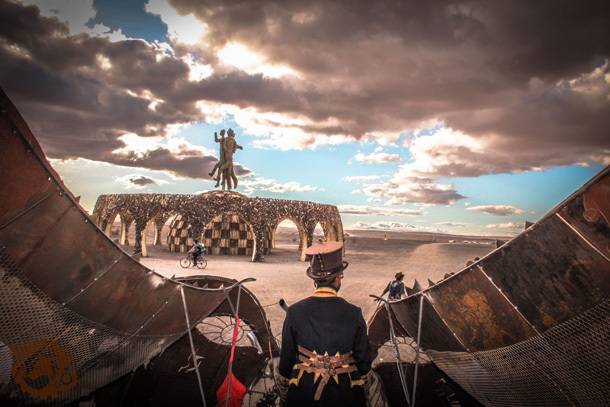 It’s easy for outlandish ideas (in such an expressive space such as AfrikaBurn) to get lost amongst spontaneous chatter and an intoxicated lapse of memory. But I am not one for weightless words, and said: “Next year we are building a train.” What at first seemed an unrealistic concept and perceived by many as fantasy later became a reality. Nine months later to be precise – a perfect incubation period for our baby, Lobo. I broke my Burn virginity in 2009 as I embarked on a new life in Cape Town after departing from Durban in my car. I had just returned from a soul-searching adventure in South America, which included a quest for an ayahuasca journey (which found me in the magical hilltops of Cusco, Peru). I had heard something about this annual ‘gathering of the arts’ and decided to head straight to the festival from Durban with what I could load into my car, with my sights set on Cape Town thereafter to start afresh. 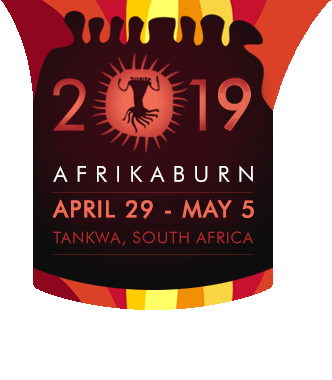 With the festival still in its infancy and my head unsettled for the move ahead, I experienced only the surface of what Afrika Burn really is. It would take two more years to experience beyond the creatively free space that Burn provides, and engage in a deeper state of conscious flow. 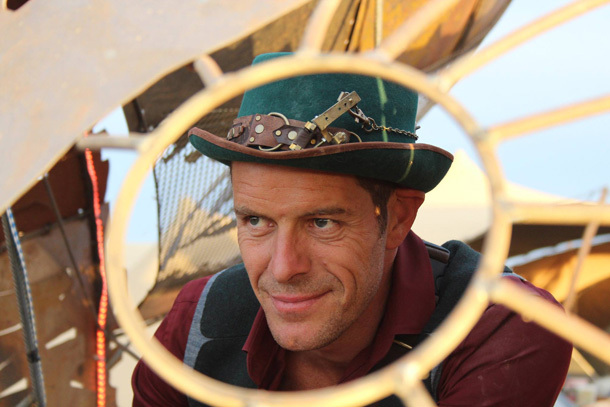 AfrikaBurn 2013 – my most memorable Burn thus far, and where I connected with what would be a future friend and creatively motivating partner – But Corpaci. I think it is this kind of duality – of freedom and connectivity that I experienced that gives us a new understanding of what a money-less society and community represents. A space devoid of hierarchy, a space to remove yourself from ego and explore random acts of selflessness. There was a natural flow to my experience of 2013, where I wanted for nothing and began to see this environment as a wealth of information – for you to use if you choose. The information is available, from those you attract or yourself – if you look hard enough. “That can’t be the Clan” I said, as I stared with irreverence at the evil rabbit installation of 2014 (which was indeed the Clan). One year later I would be wiping tears from my eyes standing in the heart of this crazy, yet beautiful wolf train, listening to the first soundtrack (curiously named ‘Waiting For A Train’) and watching young and old running besides what felt like a UFO landing on Mother Earth ! 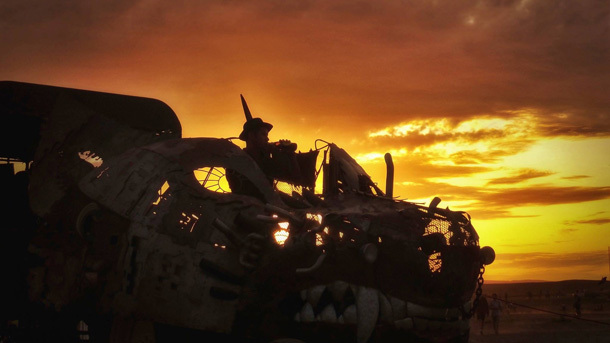 AfrikaBurn 2014 blew over and after a few months of the concept lingering in my head I decided it was time to commit and attempt to find those who may embark on this ambitious adventure with me. Little did I realise the challenge that lay ahead. However a crew was formed and most importantly plans galvanised with the full commitment and passion of But Corpaci, who brought with him a very logical and thorough approach to life and technical skillset to implement our ideas. Our concept became a consolidated vision on the day of January 5th 2015 as we headed for the beach with my puppy ‘Edge’ (who was without doubt an inspiration for the wolf, project mascot and smile giver to all who met him throughout). The train received an identity that day, which brought the story home of the spiritual aspect that is an intrinsic part of the tale. An organic progression and culmination of circumstance deeply rooted in conscious awareness. Sounds like an illusion of literacy but, in fact a true story. But and I would soon be sitting for countless hours, brainstorming design, logistics and functionality of every facet of the project. It consumed our minds and became difficult to ignore – often struggling to fall asleep at night. We faced insurmountable challenges throughout – particularly in the early stages of the design process. With such a large art project our biggest enemies were space & time – fittingly so, since Lobo needed so much of it. Funding was, funnily enough not our biggest challenge because of the sheer joy the project was injecting into our souls, and we knew we would fund it ourselves if we had to. So that’s largely what we did, without a moment of regret. Words are few to adequately colour the spectrum of emotion we experienced and the guidance we received from what I can only believe was a divine force – generated through pure passion and dedication. From the highways in the sky … to the poetic timing of Buffy (head artist) crossing our path as we spoke of him … the no-mans’ land in the heart of the CBD which sits against train tracks and is owned by a fellow named Rael (which ultimately became the home for Lobo) … the Equadorian Sculptor, Javier – who presented himself after we decided we needed a sculptor … and Chris Barnaard (our chef & photographer) with the unbelievably fitting name for the man who would nourish those who kept the heart of Lobo alive. An inspired process of synchronicity and creativity that brought strangers together and will hopefully live on inside of us for many years to come. What has since unfolded (certainly on personal levels for our crew) has organically embodied its name-sake, and the spirit in which it began – that of selflessness. We have endeavoured to think beyond ourselves and start a fund for an under-privileged 14-year-old kid who had the misfortune of a near-fatal accident with us during the course of the project. Though no fault of our own, we visited him in hospital and were touched by both the child’s bravery and sadness, and we sympathised for his dire living conditions. The Spirit Train is a medium for us to offer him a better chance at life and feel the love he has been deprived of thus far. 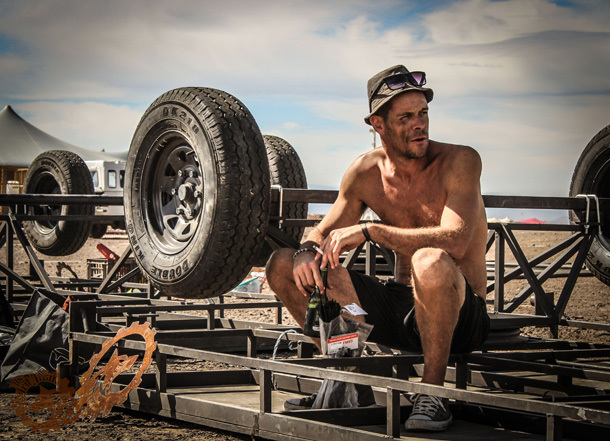 We hope to introduce him to our crew at Burn 2016 and integrate him into a community of love and opportunity. Therein lies the magic of sharing an original project in a community that are transformed through its deeply challenging dynamics. 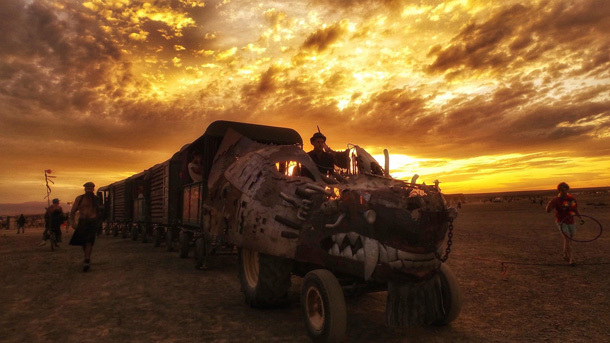 We sought to bring life to a train, but this train has a name – affectionately known as Lobo. As a youth (ages 8 onwards) I felt a deep sense of questioning, of seeking out purpose … with a distinct sense of insignificance as a human on this earth. We function like ants with apparent purpose but actual insignificance – or so it seemed to me then. I wanted to make a difference (be it big or small) and have since maintained this insatiable thirst to do something radical. I feel I have done this with The Spirit Train and have just wet the lips of my untapped creative force. I feel justified, extremely satisfied, stronger, inspired … but overall I feel transformed.